You know how people use the expression "Close, but no banana" when something is near perfect, but not quite there yet. For this blueberry cereal, I'd use the expression "Close, but no blueberry". This is a cereal box filled with promise that's never quite delivered. This cereal smells like blueberry and you get an occasional bite that tastes like blueberry. But all this does is make you wish there was more blueberry flavor in the majority of spoonfuls which are lackluster compared to the unpredictable bursts of flavor. Most of the blueberry flavor is derived from oat and blueberry clusters. These clusters have a tendency to shift to the bottom of the box. So give the package a gentle shaking to get optimal flavor from this cereal. The flakes are covered in blue specks and give the appearance of blueberry excitement, but the amount of berry flavor in the flakes is weak compared to the clusters. If someone on Kellogg's product development team had said, "Add a few more clusters," I think we'd be talking about a near-perfect cereal here. 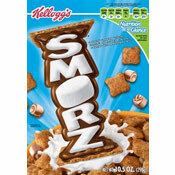 But as it stands, this is a pleasant cereal with a nice crunch, a subtle blueberry flavor and occasional bursts of great blueberry flavor. To make a sports analogy, Blueberry Special K could have been in the Super Bowl of cereals, but because they didn't use their best player (the clusters) enough, they just missed the playoffs. For a better blueberry cereal experience, try Kellogg's Blueberry Muffin Frosted Mini-Wheats or Kashi's Heart To Heart With Wild Blueberry Clusters. Nutritional Considerations: Each 3/4 cup serving of Blueberry Special K (with fat-free milk) has 100 calories, 0 grams of fat, no cholesterol, 2 grams of protein and 23 grams of carbs (including only 1 gram of dietary fiber). The smattering of vitamins and minerals is respectable with most listed at about 35% daily recommended value. 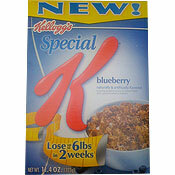 What do you think of Blueberry Special K? I really like the blueberry cereal. I even eat it dry. I put some in a plastic bag and bring it with me when I'm running errands. Sometimes I add dry fruit, etc.. Kind of like a granola mix. My favorite is the original Special K cereal with ice cold milk. I just opened a box of this cereal and it was full of crawling black bugs! I think it's a really good cereal. I ate this cereal and became sick off of it too! Right after I sat the bowl down I immediately got up and threw up! I thought I got sick off of the milk but it was regular whole milk but now I know after reading the comments now I know not to give it to my son anymore thanks special k!!!! I regret spending $4.50 on this cereal. It's so expensive for the little amount you get. I thought there would be blueberry oat clusters, but what you get are large Special K rice flakes sprinkled with tiny specks of blue (blueberry flavoring powder I suppose) with tiny oat clusters (each having 4 oat flakes at most). The blueberry flavor is so subtle and overpowered by the sugar coating on each flake. This cereal is way too sweet. I don't know how I will finish the entire box... I guess I will have to treat it like candy or something. I called Kellogg's to see why Special K red berries has the natural preservative but Special K blueberry has the killer BHT. The women who answered wasn't helpful and didn't know why. She also seemed annoyed with my question. I won't even give my dog food with BHT why would I feed my family a cereal with BHT. Why don't these company use the more natural and safer preservative like tocoperol etc? If you're expecting a big blast of blueberry goodness then don't get your hopes up, it does however have a nice blueberry tint though, it tastes like it was lightly sprinkled with blueberry uh powder? Anyways... I liked it, it didn't have any actual blueberries in it though. I disagree completely! I bought a a box of this the other day and thought it was fantastic! Of course a box of cereal is NEVER going to taste like a blueberry because... well... I hate to state the obvious but its NOT a blueberry! On the other hand, I too got a sore stomach when I ate it with milk, but this morning I sprinkled some on top of yogurt and it seemed perfectly fine. Added a bit of flavoured crunch to it! Hopefully Kellogg's will look into this sickness that seems to be sweeping us Special K consumers... it's too good to have problems! I also got sick twice (severe stomach pain and throwing up) after eating this cereal (with just some soymilk on it) and nothing else. I was fine the rest of the day after, so it was definitely food related. I have had it since (new box) and not had issues... but I definitely think I got a bad box! I tried this product and became ill the two times that I ate it. Had severe stomach pain and am not sure if it was caused by this cereal or not. I ate nothing else with this except 2% milk on it. Contacted Kellogs and passed this along to them incase there was a problem with that lot. Have you ever tried Blueberry Morning by Post Selects? Much better!! I'm a fan of plain old Special K. This one really makes for a nice blueberry change. I felt the flavor tasted pretty natural and though not a very bold it's just a nice kick to flavor the big, crispy, classic Special K flakes.